With a slight, unexpected lift provided by Hurricane Sandy, Mother Nature’s October surprise, President Barack Obama appears poised to win his second term tomorrow. Our final Electoral College projection has the president winning the key swing states of Colorado, Iowa, Nevada, New Hampshire, Ohio and Wisconsin and topping Mitt Romney, with 290 electoral votes. This has been a roller-coaster campaign, though very tight ever since Romney dramatically outshone Obama in the first debate in Denver on Oct. 3. Yet for a challenger to defeat an incumbent, the fates must be with the challenger again and again. Who could have imagined that a Frankenstorm would act as a circuit-breaker on the Republican’s campaign, blowing Romney off center stage for three critical days in the campaign’s last week, while enabling Obama to dominate as presidential comforter-in-chief, assisted by his new bipartisan best friend, Gov. Chris Christie (R)? Adding to the president’s good fortune was a final jobs report that was basically helpful because it wasn’t disastrously bad — that is, the unemployment rate failed to jump back above the psychologically damaging level of 8%. Romney could have used that number to build a crescendo for change. Instead, the final potential obstacle to Obama’s reelection passed by as a one-day story. 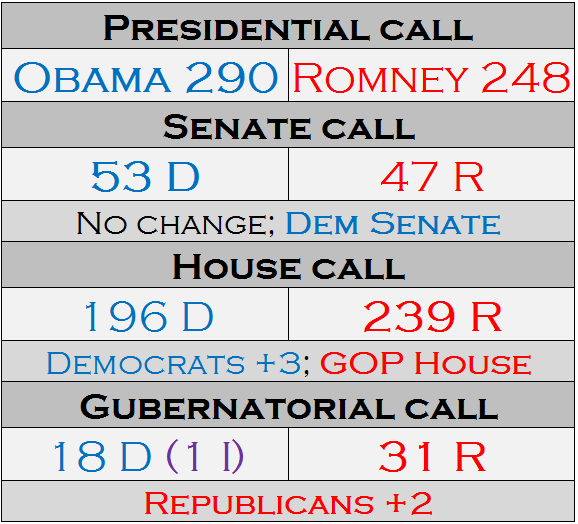 While Romney surged after the first debate, he never quite closed the deal in the key swing states. And now, we believe he has run out of time. First, the easy ones. 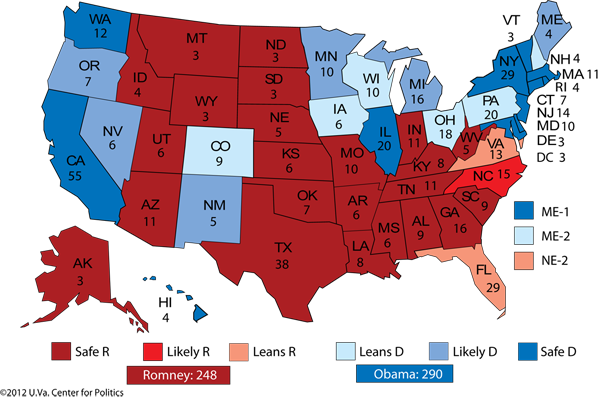 Obama has no chance in Indiana and Missouri (the former he won and the latter he nearly captured in 2008), nor in Arizona. This guarantees that a victorious Obama would be the first president ever who failed to win an additional state in his successful reelection bid that he did not win in his initial victory. (We are not counting FDR’s third and fourth elections.) Meanwhile, after having placed North Carolina in the Republican column for more than a year, we have seen no indication that Obama really has a chance there, even though Romney’s margin of victory is unlikely to be huge. We feel less confident about Florida, which teeters between Romney and toss-up status. Obama could steal the Sunshine State from Romney if the Democrat has an unexpectedly strong night. With two-thirds of the votes likely already cast in Nevada, Obama appears to have a solid lead in the Silver State. Our decision to move Nevada even more strongly into Obama’s column is bolstered by the state’s political guru Jon Ralston, who picked Obama to win his state on Sunday. Iowa and Wisconsin may very well be tight, as they were in 2000 and 2004. But these states have a Democratic lean (even Michael Dukakis won them in 1988), and according to the poll averages, Obama has never trailed in either state during this campaign. Recent surveys from credible, state-level pollsters (Ann Selzer in Iowa and Charles Franklin in Wisconsin) show Obama with solid leads in both states, and these results have reinforced our inclinations. We have had Ohio in Obama’s column since late September, and nothing we have heard from our sources in the Buckeye State has caused us to move it anywhere else. Like Iowa and Wisconsin, it may be excruciatingly close, but we favor Obama in all three. We believe the three closest states are Virginia, Colorado and New Hampshire; in reality, all three are toss-ups, but because we feel obligated to pick every state, we’re splitting these 26 combined electoral votes right down the middle — 13 for Obama (nine from Colorado and four from New Hampshire) and 13 for Romney from Virginia. It’s not very scientific, but in these three states the polling averages and our sources aren’t giving us enough to work with. 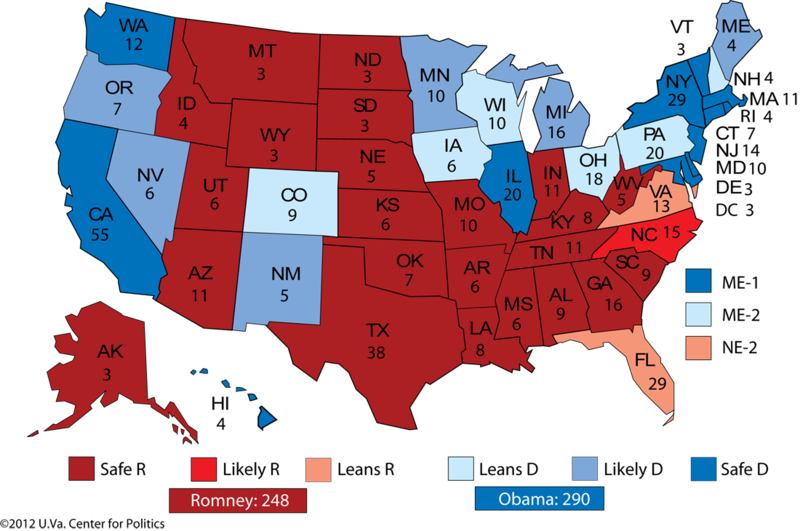 If Obama sweeps all three of these very close states, he will win 303 electoral votes. If that number sounds familiar, it’s because both Harry Truman in 1948 and John F. Kennedy in 1960 achieved the same total in the Electoral College. In other words, it’s a lucky number for Democratic presidential nominees. A footnote: Maine and Nebraska award their electoral votes by congressional district, and Romney has an outside shot at grabbing Maine’s Second District, just like Obama has an outside shot at Nebraska’s Second (which he won in 2008). We don’t foresee an electoral vote split in either state this year, but these are worth watching Tuesday night for a possible surprise. A status quo election at the presidential level could also result in an absolute status quo in the Senate. After allocating our two remaining toss-ups — Rep. Jeff Flake (R) should win in Arizona over former Surgeon General Richard Carmona (D) and Obama’s coattails may allow Rep. Tammy Baldwin (D) to squeak out a victory over former Gov. Tommy Thompson (R) in Wisconsin — we’re left with a Senate that looks exactly the way it does now: 51-47 Democratic, with two independents caucusing with the Democrats. 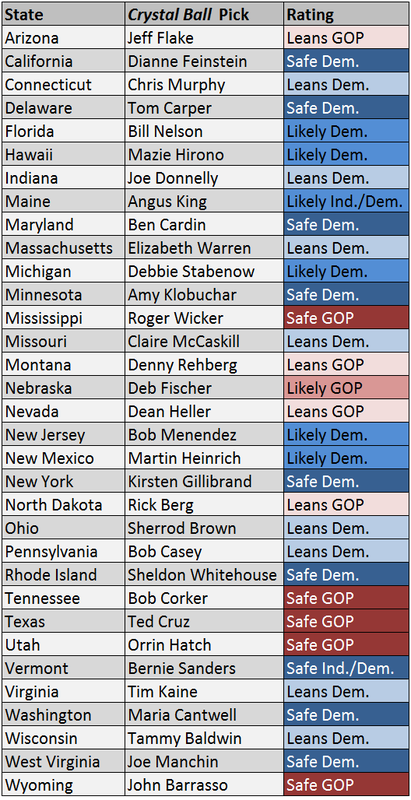 The races we feel least confident about are in Montana, where Sen. Jon Tester (D) could very well hang on against Rep. Denny Rehberg (R), as well as Indiana and Missouri, where damaged Republican candidates Richard Mourdock (IN) and Todd Akin (MO) might actually have a shot because of Romney’s coattails. Of the two, Akin’s chances may be better because Sen. Claire McCaskill (D) remains unpopular. In the event of a Virginia vote as close as we foresee, former Gov. Tim Kaine (D) should be able to run ahead of former Sen. George Allen (R), but a bigger-than-expected Romney win could lift Allen. 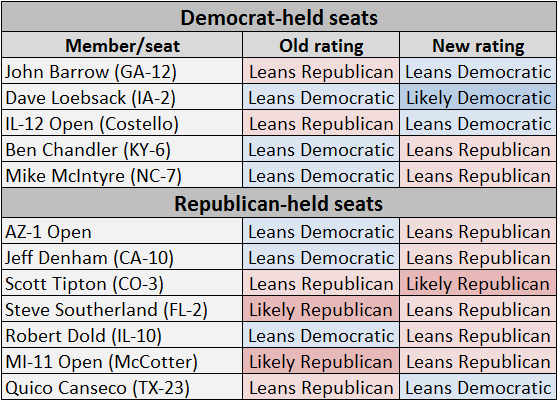 While Republicans could actually pick up a few seats, our best guess is that Democrats will still gain a handful of seats. The rating changes above reflect late tips from our sources as well as our own instincts. 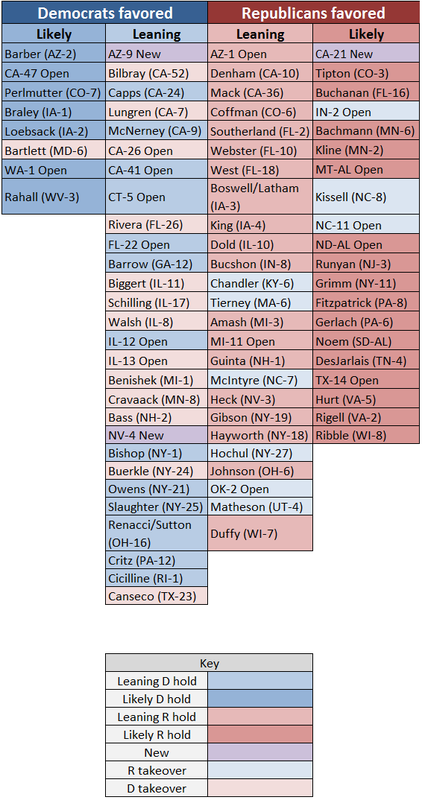 Inevitably, we’ll miss a fair number of House races, but every two years, we make an effort to pick them all, and we are pretty confident that the final net result will come close to our projection. In other words, we do not expect much net movement in the House either way, which would be a substantial victory for the Republicans. While Montana Attorney General Steve Bullock (D) is in many ways a stronger candidate than ex-Rep. Rick Hill (R), we see the Republican label as a dominant advantage in the state on Tuesday. 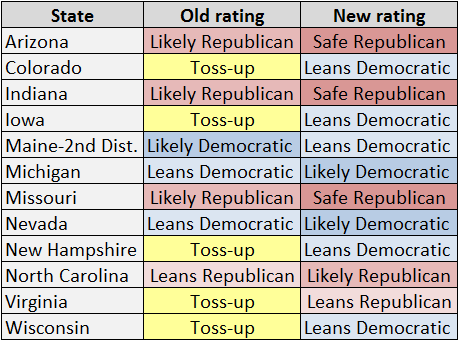 Our other ratings remain unchanged, with North Carolina joining Montana in switching to the GOP. It is a conundrum that the voters may well endorse the status quo in the White House and both houses of Congress in a time of widespread unhappiness about the economy and other matters. Still, elections are comparative choices, and that explains part of the result. It may also be that people sense an improvement in the country’s condition, or believe it is forthcoming. Or perhaps the power of demographics in a highly polarized, partisan era simply overrides other factors. Once we have the actual results, we can begin the process of chewing over the returns and searching for their overarching meaning. 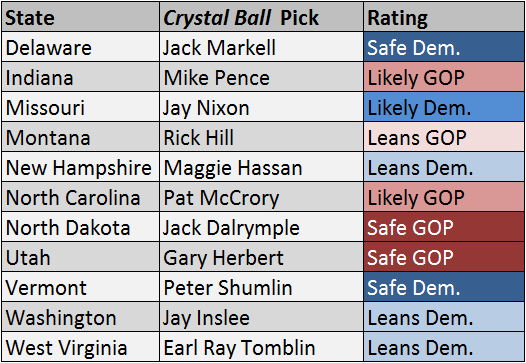 For now, we want you to know that we’ve enjoyed spending this election cycle with you, and we appreciate all the tips and opinions you have passed along to the Crystal Ball. The next election cycle essentially begins on Wednesday; we’ll need your help anew. There are elements of the 2012 election that still confound us, and this is not one we project with supreme confidence. The picks presented in this edition represent our best judgment, but we’re as fallible as all prognosticators. Expect some — many? — of our projections to prove inaccurate. As we always warn our readers, those who live by the Crystal Ball end up eating ground glass, and we keep some Tabasco sauce handy to help the glass go down. Fortunately, there’s always another election, and we’ll be there with you to experience it.